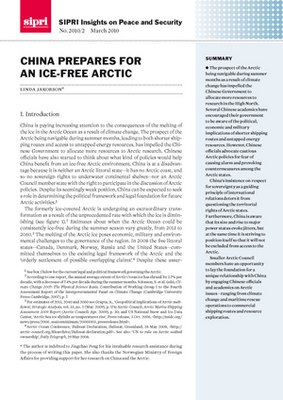 In this SIPRI published report, Lowy Insitute East Asia Director Linda Jakobson examines how the prospect of the Arctic being navigable during summer months (as a result of climate change) has impelled the Chinese Government to allocate more resources to research in the High North. Several Chinese academics have encouraged their government to be aware of the political, economic and military implications of shorter shipping routes and untapped energy resources. However, Chinese officials advocate cautious Arctic policies for fear of causing alarm and provoking countermeasures among the Arctic states. By actively persisting to further engage Chinese officials and academics on Arctic issues—ranging from climate change and polar research to commercial shipping routes and maritime rescue operations—Nordic countries can already start laying the foundation for a special Arctic- orientated relationship with China. China’s insistence that respect for state sovereignty be a guiding principle of international relations makes it difficult for China to question the Arctic states’ sovereignty rights.